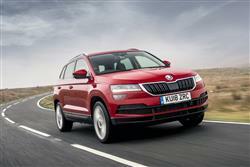 Skoda is getting serious about SUVs. Building on the success of its large, 7-seat Kodiaq crossover, it brings up this only slightly smaller Qashqai-sized Karoq model. 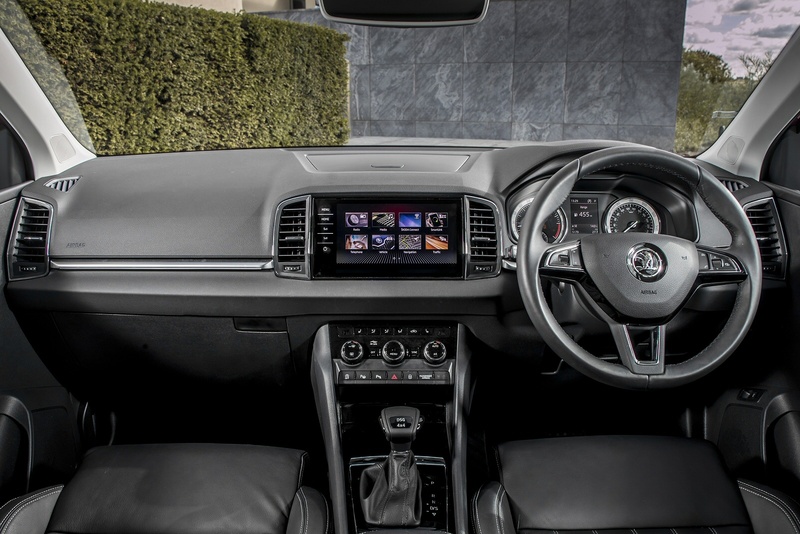 It gets all the latest Volkswagen Group technology, including a hi-tech MQB chassis and cutting-edge safety and infotainment features. 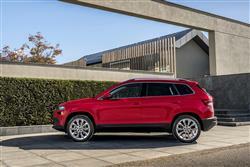 Everything in fact, that you'd want from a modern family-sized SUV of this kind. 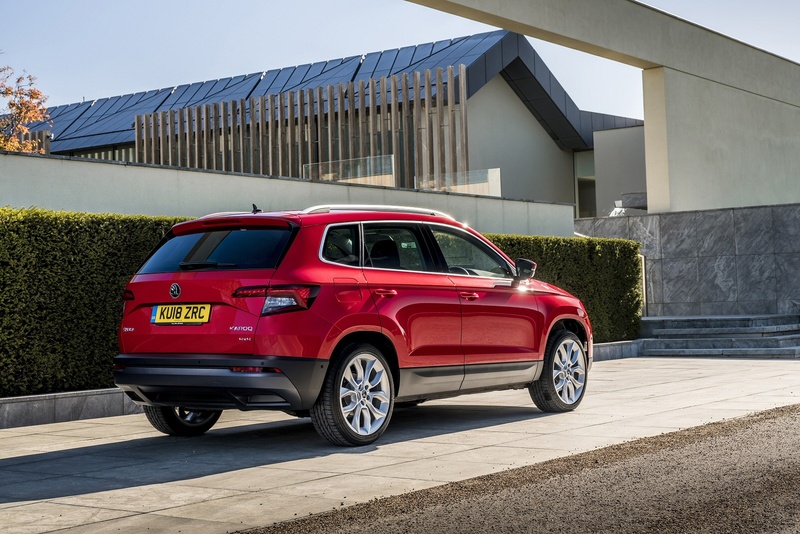 Brand identity is everything in the automotive world, so it seems hard to understand why Skoda would want to abandon one of their most recognisable name plates, that of the Yeti. Yet the Czech maker has done just that, replacing that model line with this one - the Karoq. The reason why is that the company wants to emphasise that this car is a different, larger and more sophisticated SUV than the Yeti ever was - or could be. The Yeti couldn't ever quite decide whether it wanted to be a Juke-shaped supermini-sized SUV or a Qashqai-shaped family hatch-sized model. This larger Karoq has no such dilemma, firmly targeted at the Qashqai sector - and offering a larger boot, amongst other incentives, to tempt buyers away from Nissan's market leader. If you're wondering if the word 'Karoq' has any meaning, then we'll tell you that it's taken from the language of an Alaskan tribe and, roughly translated, means 'car arrow'. Make of that what you will. 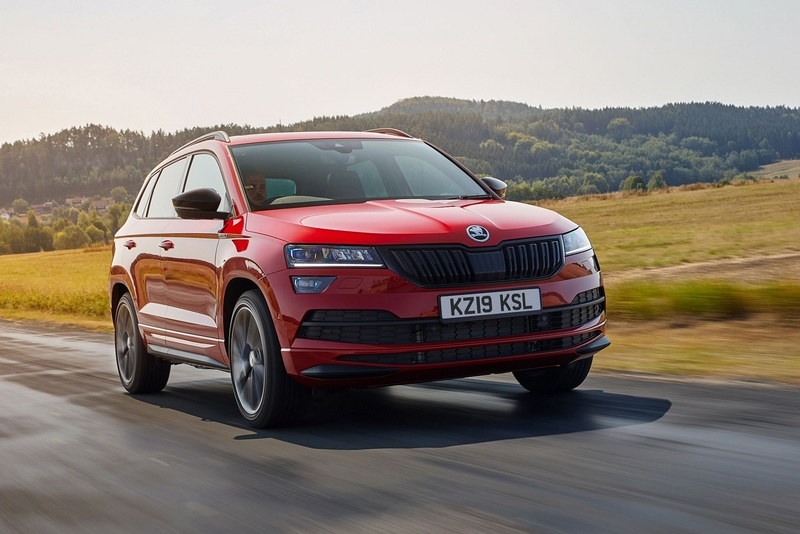 Under the skin, this Skoda uses much the same MQB chassis as you'll find in the Volkswagen Group's rival SEAT Ateca and the Volkswagen T-Roc. The set-up with this Karoq is deliberately more comfort-orientated than it is in the Ateca. The various powerplants on offer are all familiar from other Volkswagen Group models. There are five turbo-charged direct injection engine options. Things kick off with a 115PS 1.0-litre TSI petrol unit but most choose the 150PS 1.5 litre TSI powerplant. There's also a 190PS 2.0 TSI variant. There are also two TDI diesel engines, a 115PS 1.6 and a 150PS 2.0-litre unit. All the drivetrains can be ordered with a 6-speed manual gearbox or 7-speed DSG auto transmission. The 1.5 TSI petrol variant uses cylinder deactivation for an exemplary combination of performance and efficiency. Only the top 2.0 TDI 150PS diesel and 2.0 TSI petrol variants are available with 4WD; in fact you have to have AWD with these flagship versions. These derivatives are also fitted with a special 'Off Road' mode and hill descent control so that you can more easily slither down slippery slopes. In general though, this Skoda's limited ground clearance makes testing off road forays fairly inadvisable. 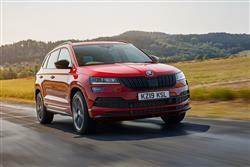 The Karoq is much happier being used for tarmac use and an option worth considering here is the 'DCC' 'Dynamic Chassis Control' adaptive damping system that can considerably improve the ride over poor surfaces. It works through the settings of the standard 'Driving Mode Select' system. 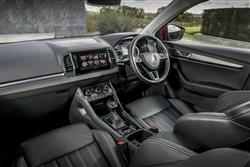 The Karoq is a slightly bigger car than its Yeti predecessor and much better able to square up to the market-leading Nissan Qashqai in the family-sized part of the volume Crossover SUV sector. 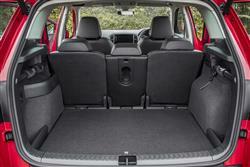 This Skoda certainly has a much bigger boot than its Japanese rival, with 521-litres of cargo space, extendable to 1,630-litres if you fold forward VarioFlex middle bench made up of three separate seats that can, if required, be taken out completely. If you do that, a van-like capacity of up to 1,810-litres is freed up. View the car in profile and the longer-than-average wheelbase by class standards is very evident and the side aesthetics are also characterised by short overhangs and a sloping roofline that's visually extended by a contour in the D-pillar. At the front, the headlights flanking the distinctive grille can optionally be ordered with full-LED beams. 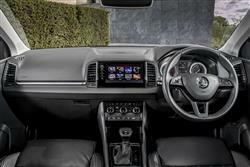 Inside, for the first time in a Skoda, a digital instrument panel is being offered. And, as usual, there are a range of 'Simply Clever' features, including an electrically-retractable tow bar. And a 'Virtual Pedal' option that allows you to open the power-operated tailgate with a wave of your foot beneath the bumper. Prices start from around £22,000 but if you go for the flagship 2.0 TDI 150PS 4x4 model and add a few well-chosen extras, you'll probably be looking at close to around £33,500. There are five trim levels - 'SE', 'SE L', 'Scout', 'Sportline' and 'Edition'. Well worth having is the optional 'Skoda Connect services' package. This consists of two things; 'Infotainment Online' gives you online traffic information and can update you on things like fuel prices, parking spaces, current news and weather. Then there are the so-called 'CareConnect Services' which allow you to monitor your car from your smartphone, plus the set-up includes a breakdown call function and will automatically alert the emergency services if the airbags go off in an accident. In terms of camera-driven safety features, the Karoq can offer far more than the old Yeti ever could. Every model comes equipped with autonomous braking - a combination of the brand's 'Front Assist', City Emergency Brake' and 'Predictive Pedestrian Protection' systems. Buyers can also add in Blind Spot Monitoring, Traffic Sign Recognition', a 'Rear Traffic Alert' feature that'll warn you of oncoming traffic when you're reversing out of a space and a 'Driver Alert' system that watches for signs of drowsiness at the wheel. There's also 'ACC' 'Adaptive Cruise Control' and 'Lane Assist' and if you have both these features fitted, you can also have an 'Emergency Assist' feature whereby the vehicle will be brought to a safe, controlled stop, should the driver be in some way incapacitated. 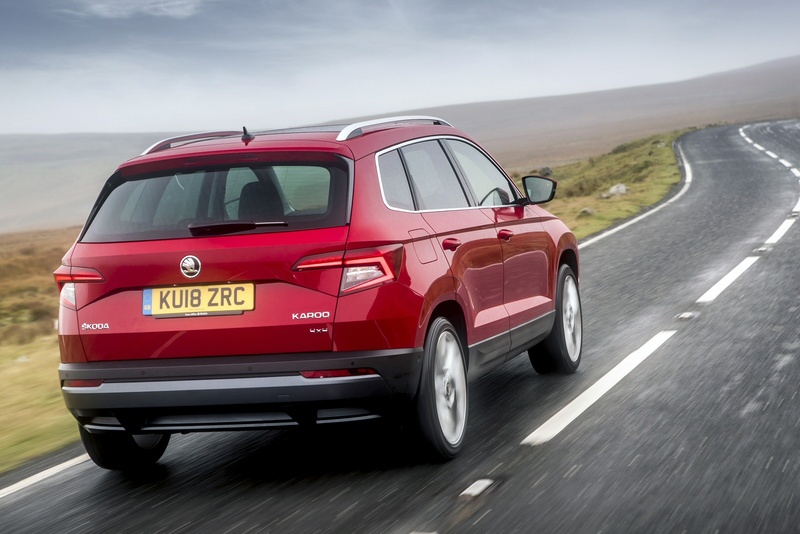 The old fashioned image of SUV vehicles being somewhat profligate when it comes to fuel economy certainly doesn't really apply to the Skoda Karoq. The 2.0 TDI 150PS diesel variant that many customers will want manages up to 50.4mpg and up to 123g/km of CO2. Go for the 150PS 1.5-litre TSI petrol unit and you should be able to get up to 41.5mpg and up to 124g/km. Whatever powerplant you choose, as you'd expect in this day and age, all models get a start/stop system that cuts the engine when you don't need it, stuck in traffic or waiting at the lights. And the DSG auto transmission is equipped with a 'coasting' function that at cruising speeds, will disconnect the gearbox, leaving the engine to idle until you next need it. Like most modern diesels, all the TDI units on offer get a selective catalytic reduction filter to cut down on nitrous oxide and have been designed around the use of a urea-based solution called AdBlue. This is injected into the exhaust gas stream to help clean up emissions, the liquid used being stored in a 12-litre tank mounted at the rear beneath the boot. This will need topping up as part of regular servicing and you can monitor its status via dashboard display. 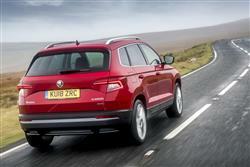 If you�re looking for a new SKODA Karoq 1.6 TDI SE Technology 5dr Diesel Estate for sale, you�ve come to the right place. At Bristol Street Motors we don�t just have the best SKODA Karoq 1.6 TDI SE Technology 5dr Diesel Estate deals, we also offer friendly advice and help with all your enquiries to ensure your buying experience is a happy experience.